I am attempting to work a small bit of fiction in which a group of nobles and a few servants are celebrating the spring with some falconry. This is a plot device in which they open themselves to an ambush (they are unhorsed for cultural reasons) as they are only lightly defended (not far from home either). Unfortunately, I can't seem to find much on the actual action of falconing. When hunting using these birds, do you use dogs to flush out prey for the bird to catch (which makes the bird seem a bit like an expensive 3rd wheel), or do you wait until it finds something itself? Also, do they usually bring it back to you, or do you have to go and pick up what they've killed? I have some falconer colleagues on a couple of my sites, but I won't see them until next week, so I can't verify what I'm going to say until then. However, on my limited observation, here are some responses. A bird is very rarely flown / put into the air unless a quarry has already been spotted. I work on landfill sites and the falconers fly them there to scare away gulls. The birds will sometimes go after rats which they prefer as quarry. In a true hunt, the bird would not be put in that distracting kind of situation. But the bird will still not necessarily want to go after the prey you want it to! I'm sure this added to the entertainment value of a group of friends out together. It is possible to hunt with both dogs and birds. But it's hard work. The dog needs to be trained to flush only, otherwise it will be in competition with the bird. Birds tend to take the eyes out of dogs that go after the same quarry (I've heard alleged but never seen or heard from someone who's seen it). Some people just have the dog as a companion rather than specifically trained to hunt. Some people train them further than flushing, to chase after a second or wounded (usually ground) target if it escapes the bird. Obviously, this is from an individual point of view. An organised, nobles' hunt is more likely to have beaters, who may or may not have dogs to help flush out prey. In your case, the servants might be sent of to likely bushes and thickets to see what they can scare up. A well trained bird returns with its kill. The not so well trained ones, not so much. That bird that got distracted in the earlier paragraph is likely to be sat on a nearby branch, disemboweling its kill while its owner blows on his whistle until he's blue in the face. And good luck getting it back after that, because all you really have to rely on (as with any animal) is training and bribery (more food)! First, you have to understand that there are different kinds of falconry depending on the type of raptor you're flying. 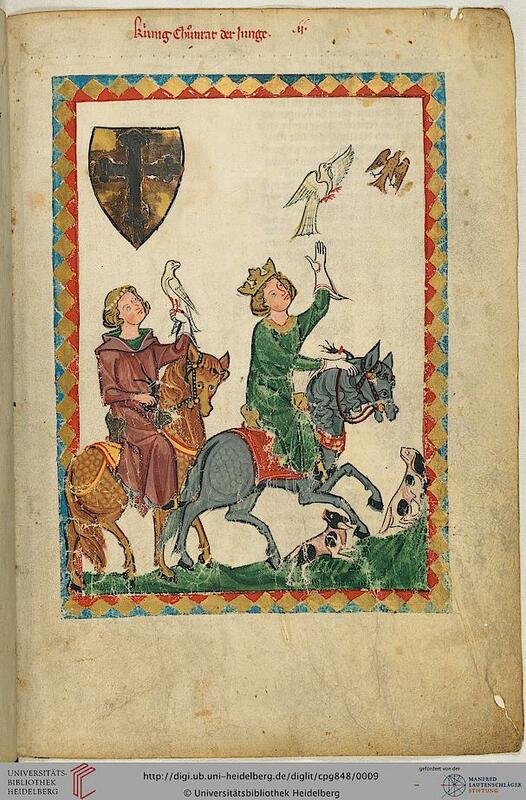 The two most common kinds used in medieval Europe are falcons and hawks, with the former being perhaps more highly regarded (but if you've seen a chart wandering the internet showing what rank of person could fly which type of bird, ignore it, it's pure social satire). When the falcon spots its prey she (always speak of raptors as feminine unless you know the specific bird is a male; because of reverse sexual dimorphism female raptors average 1/3 larger than males and are often preferred for falconry) drops from the sky like a bullet--this is called "stooping"-- and attempts to kill with her beak (unlike hawks, they have a small tooth-like projection on their beaks for this purpose). She will take it to the ground and cling to it, often spreading her wings around it to cover it from other eyes in a practice known as "mantling." The falconer (or his huntsman) then lures the bird off of the freshly-killed prey with a tidbit of food--you never allow your bird to eat from prey it has just killed. He then attaches her jesses to a leash and swivel and re-hoods her. Again, the hawk will take her prey to the ground and will usually mantle over it, and the falconer (or his huntsman) will trade the hawk a tidbit in exchange for the freshly-killed prey. This is an awkward and often problematic procedure, by the way (for both kinds of birds). The falconer should get down very low to the ground so as not to frighten his bird by looming over her (even though he's done that hundreds of times in training, the moments after a kill are different--more primal, if you follow me) and he must *never* fight her for the prey or the next time she'll try to fly away with it so he can't get it. Many modern falconers carry a towel which they drape over the prey before trying to make the trade on the principle that what is out of sight is out of mind to a falcon (or hawk), regardless of the fact that her feet are still gripping the prey, however I've been unable to determine if this was done in period. There's a *lot* more to this, with very distinct differences between falconry and hawking (e.g., falcons have "talons" while hawks have "claws") that you will need to know to write this scene convincingly. If you have any specific questions or can describe the exact scene to be depicted I might be able to help more. 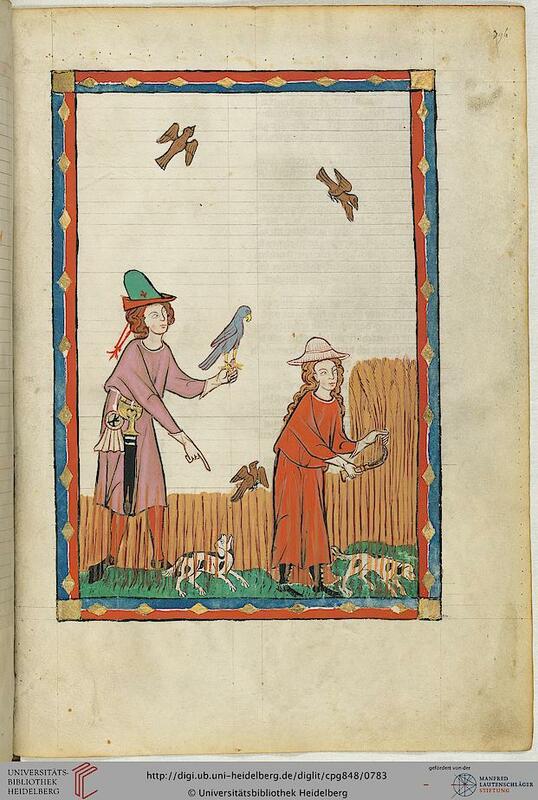 I am a licensed falconer and I also study the medieval version of the art (not so very different, believe me!). See, I knew if I committed myself to saying anything, someone with more knowledge would prove me wrong Thank you for giving a much better explanation! A bird is very rarely flown / put into the air unless a quarry has already been spotted. I'm sorry, but that's only true with hawks, not with falcons. You *can* fly a falcon directly on game you can see, but it's not playing to her strengths because she prefers to hunt by stooping, which means she must first climb up above the prey. I'm sorry, but, again, that's not correct. Raptors do not generally return with their prey (of course, never say never when it comes to live animals--there will always be weird exceptions to almost everything), which is one of the reasons you learn never to fly near a terrain feature you can't cross before the hawk could eat her kill (e.g., a pond). Some birds will take their kills up a tree, but this is usually a sign that the falconer hasn't done a good job of training the bird or has done a poor job of taking her off of her kills in the past. This is a very dangerous practice because once in the tree the bird is likely to eat to satiation, and then will have little reason to return to the falconer, however much he may signal her with a lure or whistle. Many modern falconers carry a towel which they drape over the prey before trying to make the trade on the principle that what is out of sight is out of mind to a falcon (or hawk), regardless of the fact that her feet are still gripping the prey, however I've been unable to determine if this was done in period. Ha! I thought I remembered something on this subject after I wrote the above, so I checked, and in a book from 1596 by W. G. Faulkner entitled Hawking, Hunting, Fouling and Fishing with the True Measures of Blowing he mentions covering the prey with a hat as you trade off with the tidbit. That's probably later than the scene you're writing since you specify the middle ages, but falconers are a fairly conservative lot so it's probably still valid. Thanks for the info, I thought there had to be something substantial to it. What I might do is abstract the actual act of hawking so I don't flood the scene with too much detail. I think the hawk approach would be most apt. Daily Life in Medieval Times, by Joseph and Francis Geis, has a substantial section on 13th century falconry that you could look into. It's a worthwhile purchase in my opinion, though you might be able to find a copy at your local library as well. In any case, I could attempt to find a few choice quotations from my own copy if you like, though I would highly advise looking into it yourself just for the wealth of information it contains. While the Gies' chapter on hunting isn't horrible, it's so dumbed down that I don't think it would serve well as a basis for an accurate hunting description. The arcane lexicology of falconry was in every nobleman's (or wannabe nobleman's) mouth, and the Gies, with their usual desire to appeal to hoi polloi, have ruthlessly removed all the technical terms of the art from their material. Moreover, while they describe some aspects of a hunt, they leave out many of the really important things, like the handling of the birds before and after their flights. If you want a better book that's reasonably detailed and yet still accessible for the non-falconer, I highly recommend John Cummins' excellent The Art of Medieval Hunting: The Hound and the Hawk (Castle Books, 2003). Of course, to *really* breathe life into a story, you could also get Frederick IIs seminal work on the subject. It's an amazing book but quite detailed on most subjects, and there's a new English translation available (I'd give the publication data but my copy is an older edition that's out of print; check Amazon if you're interested, but it's fairly expensive). I do DM in a custom universe (See my Cities and food thread, last post by me), which is a way for me to apply what I know.